The Volkswagen Beetle has a rich history. It is the longest running and most manufactured car of a single design platform. 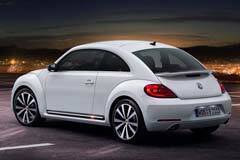 After the legendary VW beetle, came a modernized version dubbed the Volkswagen 'New' Beetle. It was the car that began the retro-futurist design craze and it immediately gained popularity among consumers who had seemingly grown tired of conservative car designs. However, since its debut in 1998, more than ten years passed without any major redesigns. Due to the steady decline in sales, VW opted to discontinue production of the New Beetle in 2010. A year later, a redesigned version was debuted. Since there is not much of design difference, shopping for a used Volkswagen Beetle is pretty straightforward. You should mostly pay attention to price, mileage and engine type. All in all the Volkswagen Beetle is definitely a distinctive small car.